Graduating from the prestigious Rajiv Gandhi University of Health Sciences in 2004, Dr Prashant worked as a general practitioner in India before moving to Australia. He cleared the Australian Dental Council examinations in 2010 and is registered with the Dental Board of Australia. 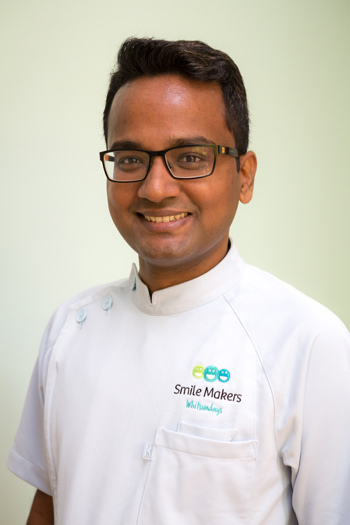 Dr Prashant worked at Queensland Health and in a private practice in Bowen before purchasing Smile Makers Whitsundays. He enjoys changing his patients’ lives with high-quality dentistry and takes pride in both the art and science involved in all ages dental care. He especially thrives on performing restorative, cosmetic and preventative dental work. A firm believer in continuing professional development, Dr Prashant keeps up to date on the latest research by regularly attending conferences and workshops. Additionally, he belongs to the Australian Dental Association, both the national and the Queensland branches. Outside of the practice, Dr Prashant likes to spend time with his wife Ketaki and their lovely daughter Meehika. He volunteers his time as a member of our local Lions International®, which is one of the most productive chapters in the world. He also enjoys watching movies and playing cricket. Insurance is accepted, and Smile Makers Whitsundays is a preferred provider for HCF. Contact us today to book your time!